When I was a Cub Scouts Webelos Den Leader, we had to complete an adventure called “Duty to God and You.” As part of this adventure, the den designed and ran an interfaith service during the Pack’s regularly scheduled November Pack Meeting. Since it was close to Thanksgiving, we picked a theme of Gratitude. I’d like to share the result of this work with you. Many of the elements of this service could be used to enrich a Thanksgiving gathering, even at the last minute. Just reading the poems, prayers, and song lyrics fill me with gratitude. I hope they do the same for you. 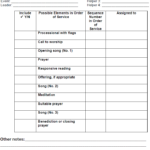 We used BSA’s Interfaith Service Planning Worksheet. It’s found in a variety of sources, including the Webelos leader guide (found here: https://cubscouts.org/library/duty-to-god-and-you). As people gathered for our Gratitude Service, we had them help create a Thankful Tree. We wanted each den to have a part in the service. I provided suggestions for prayers or songs they could do, but told them they could do anything they wanted, as long as it supported the theme of Gratitude. After the flag ceremony, one den started the service with this prayer. The Cubmaster spoke with the scouts about what being reverent means. I wish I had a copy of what he said. Sadly, I don’t. Next came a responsive reading, led by one of the Pack’s Den Chiefs (who happened to be my older son at the time). The words were provided in a simple program we handed out. The plain text was read by my son. The audience responded with the words in bold. When facing deceit and dishonesty, let us be Trustworthy. If we see hypocrisy and faithlessness, let us be Loyal. Where disregard of others and materialism prevail, let us be Helpful. In an atmosphere of ill manner, let us be Courteous. Where some measure manliness in brutality and crudeness, let us be Kind. Though lawbreaking and rule-scoffing are common, let us be Obedient. While others grumble and grouch, let us be Cheerful. In an environment blighted by waste and extravagance, let us be Thrifty. When confronted with danger and temptation, let us be Brave. As we see filth and pollution everywhere, let us be Clean. While witnessing impiety and irreligion, let us remember to be Reverent. Next, my den led a song. While we were planning the service, we considered several songs. 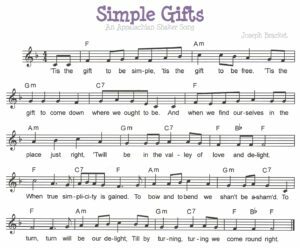 They chose the Shaker song “Simple Gifts.” I believe we used a YouTube video of the song to practice and help us during the service. 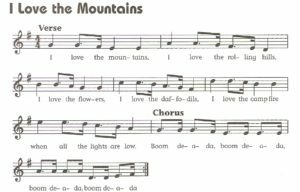 The sheet music came from the Website Making Music Fun (https://makingmusicfun.net/htm/f_printit_free_printable_sheet_music/simple-gifts-lead-sheet.php). 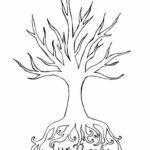 If you’d like to create a Thankful acrostic poem, here’s a download that was free from Teachers Pay Teachers. (https://www.teacherspayteachers.com/Product/Thanksgiving-Thankful-Acrostic-Poem-939563) You can see how the den’s poem ended up below. This was a really rewarding service to plan and attend. If you ever have the chance to create or participate in one, I hope you’ll do so. I’ll leave you with a little prayer of Thanksgiving. For everything They goodness sends.